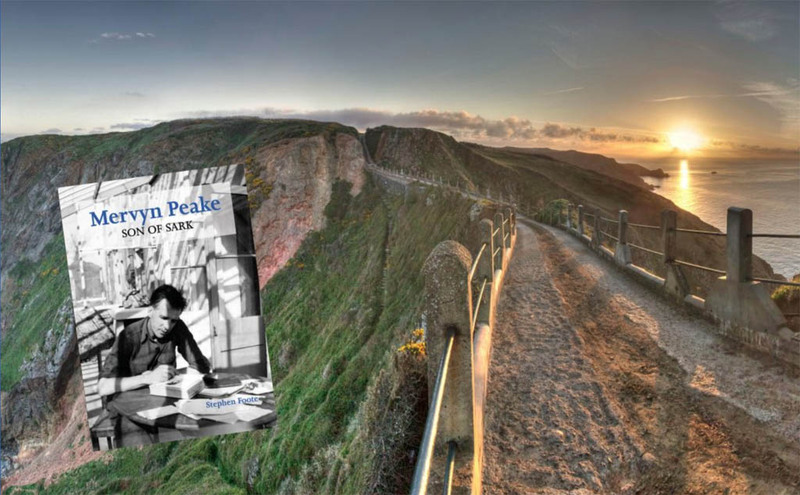 Stephen Foote has collaborated with Christian Peake and produced the most informative book about Mervyn Peake's life on Sark. It's fascinating to see just how much the island influenced Peake and his work. I'd recommend this book to anyone who's interested in that period of his life - which, of course included much of the writing of Gormenghast. 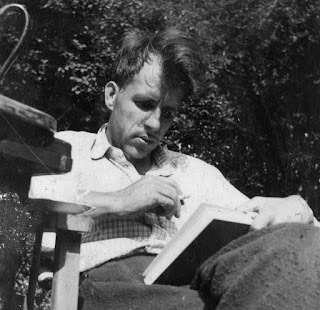 He also lived there in his twenties when he was part of the art collective, The Sark Group. Copies are available from the publisher, Blue Ormer. 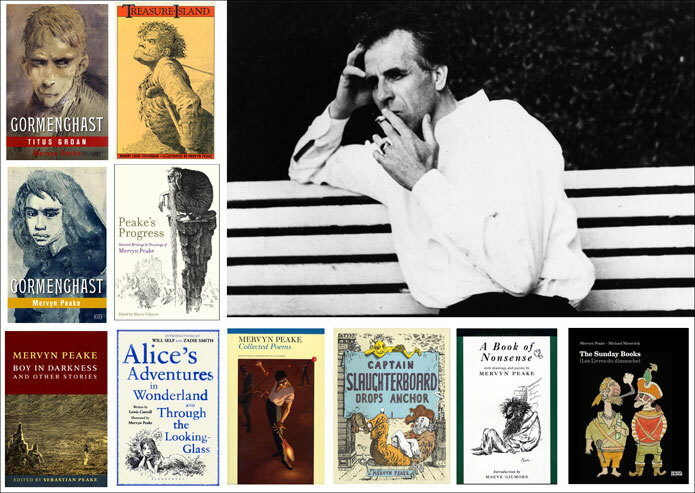 On Friday 2 November the British Library are presenting an evening devoted to Mervyn Peake, celebrating his achievements, fifty years after his death. The panel will include Fabian Peake, Neil Gaiman, Chris Riddell, Liz Jensen and Miranda Richardson. Starting at 7.30, tickets available from 3rd September. 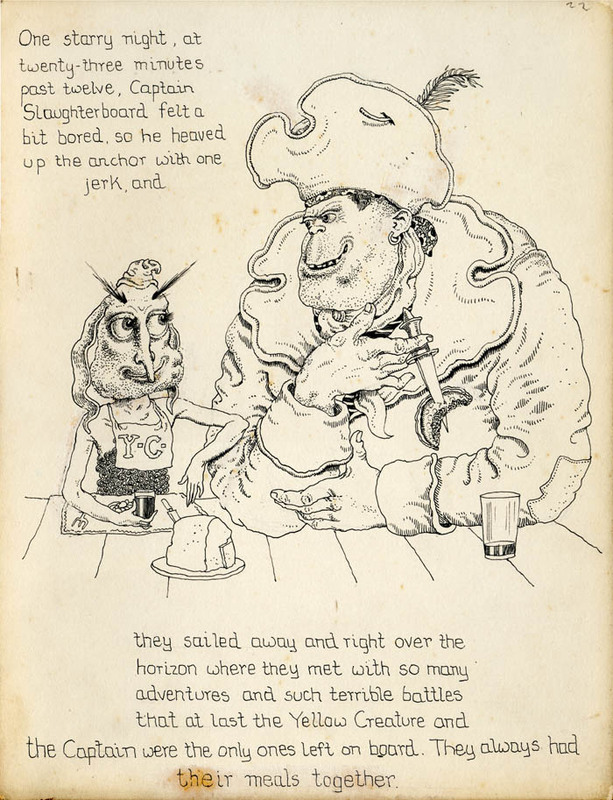 The illustrations for Captain Slaughterboard are to be exhibited at the Kunstmuseum in Luzern. It's a fascinating angle too. Once again, Mervyn Peake was working on ideas before they had become so mainstream..
"The British author and draftsman Mervyn Peake (1911-1968) created a figure with Yellow Creature already in 1939, which in every drawing between woman and man, animal and man 'changiert' and while still faithful above all remains faithful to itself. Yellow Creature is therefore the title for the group exhibition, which focuses on the relationship between gender and genres." A new German edition of "Captain Slaughterboard Drops Anchor" will be available from the museum. Sebastian Peake worked with Parkinson's UK to set up an annual creative arts competition for people with Parkinson's, the condition which, of course, affected his father's life so tragically. This year sees the 15th year of the awards, and next month a free awards exhibition of all the 2016 entries will be held at the prestigious gallery@oxo on South Bank, London. More information about the exhibition, including the programme of events, can be found here. Sebastian would have been delighted to know that his father's work was to be hung alongside work by Gunter Grass and Alasdair Gray. And there's just such a show at the Last Tuesday Society now. More information here. The Mervyn Peake Awards are a celebration of the talents of people with Parkinson's. Parkinson’s UK aims to encourage creativity in memory of the late Mervyn Peake. 2011 marks the centenary of his birth and the tenth anniversary of the awards. Anyone interested in knowing more about Mervyn Peake should consider subscribing to Peake Studies, a bi-annual publication edited and published by Peter Winnington, a world authority on the subject. 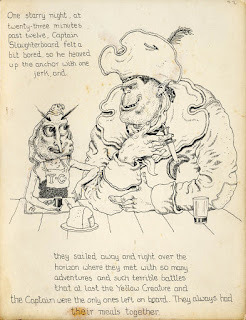 Every issue includes reviews, articles, and very frequently previously unseen drawings and other work by Mervyn Peake. 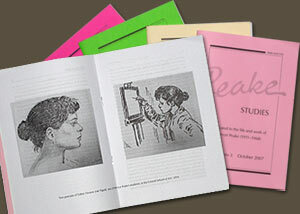 Above are examples of the publication. Announcing a major new volume on the acclaimed writer and artist is available now. Sixty years on, the world of Titus Groan and his castle remains as contemporary now as when first published in 1946. It is generally accepted that the Gormenghast trilogy as a whole offers one of the most original and sustained flights of imaginative writing of the 20th century and Mervyn Peake is best remembered for this timeless and highly influential work. Now translated into over thirty languages, to be joined shortly by Mandarin. 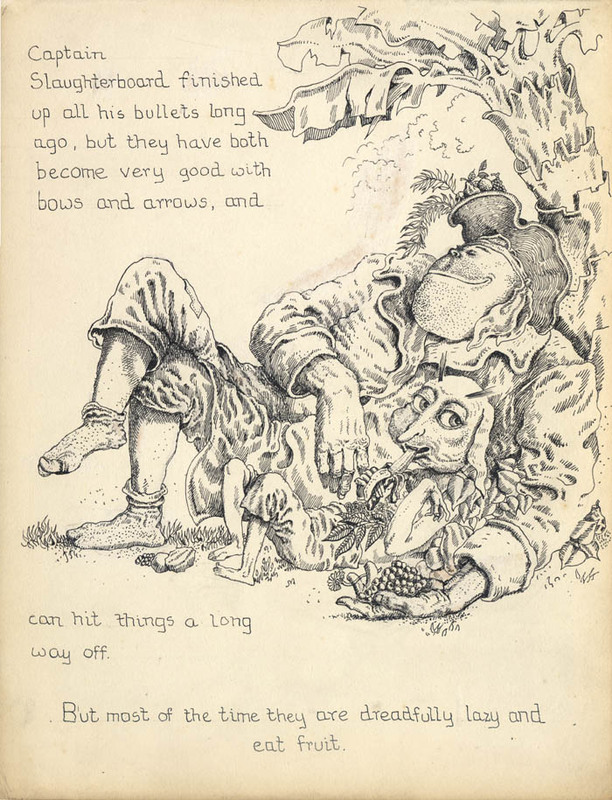 Less well known however, is his prolific output as a painter and writer of children’s books, nonsense verse, and work as a war artist, poet, and illustrator. 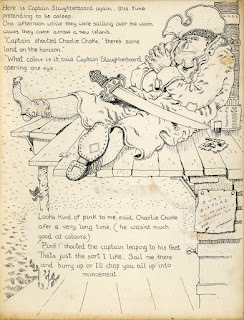 Such classic texts as Treasure Island, Alice’s Adventures in Wonderland, The Ancient Mariner, Swiss Family Robinson, The Hunting of the Snark, Bleak House and others were illustrated, resulting in idiosyncratic interpretations immediately recognisable as his own. 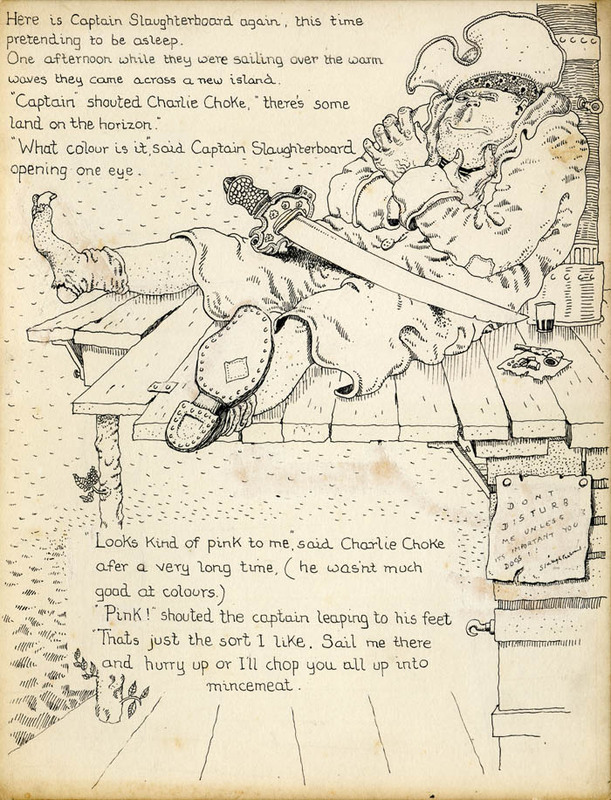 Texts were read closely before any drawings were committed to paper, though the description of the characters in the books, the location and atmosphere being brought to life, acted as the sole guide for his eagle eye, with the published drawings often remaining imprinted for ever on the reader’s visual mind. This completely new and comprehensive website aims to display as many of the above talents as possible while the motivating rationale behind the enlargement of the site was the dedication to presenting work of the whole artist, rather than the parts. He was after all, as some have suggested, the incarnation of Renaissance man. 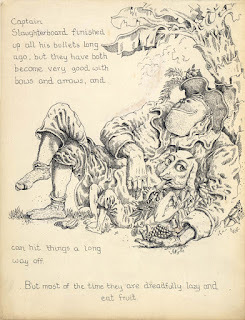 All material © The Mervyn Peake Estate.